NEW YORK – Elaine Stritch wants to tell an embarrassing story. And when Elaine Stritch wants to tell a story, you listen. "I have no secrets," the 85-year-old Broadway legend says by way of introduction as she sits at a makeup table getting her eyes done a few hours before a performance of "A Little Night Music." A few days ago, Stritch begins, she was at her Midtown hairdressers for a three-hour appointment before a show when she realized she'd forgotten her teeth. Stritch, who calls herself "a brittle diabetic," has two sets of dentures, one for the stage and one for regular life. She didn't have the ones for the theater. Stritch had no time to waste: She called over to the Carlyle Hotel, where she lives these days, to ask an assistant to find the stage teeth — they'd be in a little white container in the bathroom. She wanted them brought down to the front desk. Then she tried to call her hired limo driver, who was idling outside the salon. But she didn't have his number, and there was no time to find the car service's number. So Stritch, in a bit of a panic by now, went out to find him. "I run downstairs. I've got on the robe from the hairdressers," she says. And she leans into the window of the limo and bellows: "You've got to drive up to the Carlyle and pick up my teeth!" "Suddenly, I'm standing in the middle of 57th Street. And there's about 20 people laughing," recalls Stritch with a sly smile. "Publicity stunt? No way! No way. You don't do publicity stunts like that. Not even I could do that unless it was really happening." Spend an hour with Stritch and you'll get a lot of stories like that — funny, self-effacing and revealing. The woman seems to have an iron core: brassy and exacting and salty, but also accommodating and full of wit. "I like anything I don't know about," she says at one point. "And I don't like most of the things I do." At another point, she offers this: "The most horrible line in the English language for me is, 'God, you haven't changed a bit.' It's the worst thing you can say to anybody." Stritch has become a sort of shorthand for acting longevity since she made her Broadway debut in "Loco" in 1946. Since then, she's performed in both musicals and dramas, from Edward Albee to Noel Coward to Stephen Sondheim. She's also been in films such as "Monster-in-Law" and "Out to Sea," and on TV as the Emmy-winning mother of Alec Baldwin in "30 Rock." Her one-woman show "Elaine Stritch at Liberty" won her a Tony in 2002, and her cabaret shows at the Carlyle Hotel are legendary. Each generation finds her relevant and hip. She was recently parodied on an episode of "The Simpsons" in which Lisa Simpson attends a fancy performing arts camp. One class was on making wallets with Elaine Stritch and Andrew Lloyd Webber. Stritch lately has been getting standing ovations for her turn as Madame Armfeldt in a revival of Sondheim's musical, "A Little Night Music." She and Bernadette Peters replaced Angela Lansbury and Catherine Zeta-Jones, respectively, over the summer and have agreed to stay on until Jan. 9. Stritch plays a wheelchair-bound aristocrat who offers dry and hysterical pronouncements in her half-dozen scenes, and mourns the loss of standards in her big song "Liaisons," in which she looks back on her profitable sexual conquests of dukes and barons. "Where is skill?" she asks. "Where's passion in the art, where's craft?" 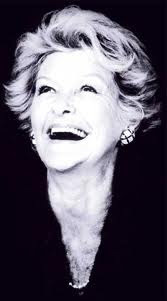 Stritch is at an age — and with such goodwill built up — that simply appearing on stage will earn her bursts of applause. But she still tries to earn it every time with a heart-tugging take on Madame Armfeldt. "It's a very hard part for me. Don't ask me why. I don't know why. Some parts just don't blow me away. This one did. There's a lot of new kind of emotions," she says. "You don't want to go into that because an actor talking about how they do their stuff is more boring than anything I can ever think of." Stritch has one issue she'd love to leave as her legacy: reducing the standard eight-shows-a-week contract that performers sign. "I wish I could leave the building with that having been accomplished — seven shows a week. Eight shows gets to be too much," she says. When producers of "A Little Night Music" asked her and the cast to do nine performances a week, Stritch had a fit. She gleefully displays a letter she wrote demanding a change: "Try to understand our physical, emotional, physiological desperation," it read. Producers soon backed down. Stritch is already planning her future when this musical ends. She's considering doing an evening of just Elton John songs: "You don't know what I can do with those songs," she says. "It might be fun and unusual."